A Russian Soyuz booster successfully launched Wednesday from the Baikonur Cosmodrome and propelled a resupply freighter on its two-day pursuit to rendezvous with the International Space Station. Liftoff of the unmanned Soyuz booster carrying the automated Progress vessel from the launch base in Kazakhstan occurred at at 6:06 p.m. EST (2306 GMT), beginning Russia's first of five cargo delivery missions in 2012 to the space station. The preliminary orbit was achieved after a nine-minute ascent provided by the three-stage rocket, and onboard commands were issued to unfurl the craft's communications and navigation antennas and extend two power-generating solar arrays that span 35 feet. A series of precise engine firings over the next two days will guide the Progress toward an automated rendezvous with the station for docking Friday at 7:08 p.m. EST (0008 GMT). The 24-foot long ship will attach itself to the open port on the Pirs compartment on the underside of the station, which became available Monday when the previous Progress flew away to enter a higher orbit where it ejected a plasma science satellite Tuesday evening shortly before deorbiting into the South Pacific. Today's launch was known in the station's assembly matrix as Progress mission 46P. The spacecraft's formal Russian designation is Progress M-14M. The craft will bring nearly three tons of supplies to the station. The "dry" cargo tucked aboard the Progress amounts to 2,778 pounds in the form of food, spare parts, life support gear and experiment hardware. The refueling module carries 2,050 pounds of propellant for transfer into the Russian segment of the complex to feed the station's maneuvering thrusters. The vessel also has 926 pounds of water and 110 pounds of oxygen and air. It'll remain attached to the station through the end of April. The space station is staffed by the Expedition 30 crew of commander Dan Burbank, NASA astronaut Don Pettit, Russian cosmonauts, Anton Shkaplerov, Anatoly Ivanishin and Oleg Kononenko, and Dutch astronaut Andre Kuipers. The cosmonauts will be standing by Friday to take over manual control of the approaching Progress spacecraft if the autopilot experiences a problem. They will spend time this week checking out the backup system. 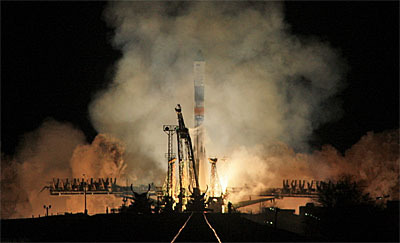 Russian plans additional Progress missions in 2012 to continue the resupply chain to the space station in April, July, October and December. Orbit Insertion 0/00:08:45 6:15:25 p.m.
(9.82 m/s) 0/03:40:03 9:46:43 p.m.
(23.34 m/s) 0/04:11:50 10:18:30 p.m.
(2.00 m/s) 1/00:36:47 6:43:27 p.m.
(30.015 m/s) 1/23:03:04 5:09:44 p.m.
(1.238 m/s) 1/23:27:07 5:33:47 p.m.
(31.120 m/s) 1/23:48:34 5:55:14 p.m.
(Range 80 km) 1/23:52:39 5:59:19 p.m.
Orbital sunrise 2/00:01:06 6:07:46 p.m.
(Range 15 km) 2/00:13:59 6:20:39 p.m.
(Range 9 km) 2/00:19:39 6:26:19 p.m.
(Range 8 km) 2/00:20:59 6:27:39 p.m.
(Range 3 km) 2/00:28:39 6:35:19 p.m.
(6.386 m/s) 2/00:29:11 6:35:51 p.m.
(Range 2 km) 2/00:31:19 6:37:59 p.m.
(5.463 m/s) 2/00:33:55 6:40:35 p.m.
(1.961 m/s) 2/00:36:37 6:43:17 p.m.
Start flyaround 2/00:39:46 6:46:26 p.m.
Start stationkeeping 2/00:46:03 6:52:43 p.m.
Start final approach 2/00:51:40 6:58:20 p.m.
Orbital sunset 2/00:58:02 7:04:42 p.m.